Alexander Francis Wojciechowicz was born August 12, 1915 in South River. Rock solid, fast and aggressive, Alex was a standout in every sport he played. At South River High School he earned letters in football, baseball and basketball. 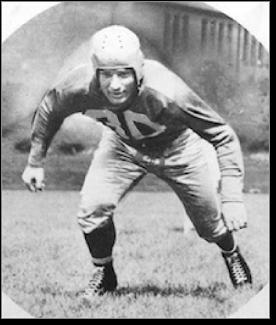 A two-way lineman on the football team, he was an All-State pick as a senior in 1933. Alex earned an athletic scholarship to Fordham University, where he became the linchpin for the Seven Blocks of Granite, a front line that blended mobility, technique and power to give the Rams an awesome running attack. At 5–11 and a shade under 200 pounds, Alex was smallish for a center. Of course, on the same Fordham line was tackle Vince Lombardi, who stood a mere 5–8. Alex was at his best against Fordham’s chief rival at the time, Pitt. In each of the three games (all Fordham victories) he played against the Panthers, the Pitt players singled him out as the man who beat them. 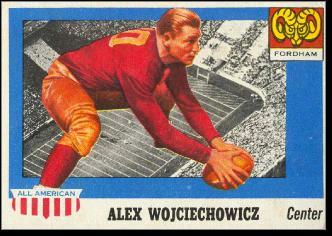 A two-time All-American, Alex helped the Rams to an undefeated season in 1937 on both offense and defense. Not a single touchdown was scored against Fordham that fall. Alex joined the Detroit Lions in 1938 after being selected in the first round of the NFL Draft. He started at center and linebacker for Detroit as a rookie, and proved adept against the bigger, faster pros. Playing in the same era as all-time great center Mel Hein, Alex was still named All-Pro center twice with Detroit, and in 1944 he set a team record with 7 interceptions. “Wojie” was easy to spot on the field. He employed an exaggerated spread-legged stance when snapping the ball. Off the field, he was hard to miss, too. Gregarious and friendly, he was a great favorite among his teammates and Detroit fans. Three games into the 1946 season, the Lions dealt Alex to the Philadelphia Eagles. The Eagles were loaded with talent. Alex supplied veteran leadership, playing almost exclusively on defense after age 30. In 1948 and 1949, the Eagles won back-to-back championships. Their relentless defense made the difference in both title games, and Alex was the heart and soul of that unit. He hung up his jersey after the 1950 season. Alex was inducted into the College Football Hall of Fame in 1955 and the Pro Football Hall of Fame in 1968. A lifelong New Jersey resident, he went into the real estate business before retiring to South River, where he died in 1992 at the age of 76.